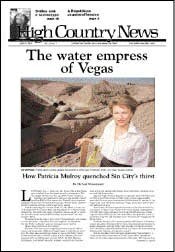 Patricia Mulroy, general manager of Las Vegas Valley Water District and Southern Nevada, Water Authority, has kept water coming to her booming desert city, but environmental concerns and water-quality problems are signs that her water empire can't last forever. Writer and organic farmer Donella Meadows is remembered as a journalist, and much more. "Sunk Without a Sound: The Tragic Colorado Honeymoon of Glen and Bessie Hyde" by Brad Dimock tries to retrace the journey and unravel the mystery behind a 70-year-old tragedy. Fancy toilets of "green built" resort; California vs. Washington; Lewis & Clark and Jet Skis; Winnebagos and floating condos; Michael Tomlinson vs. applicances; Berkeley, Calif., honors "companion animals." Putting California on HCN's map; visitors; death of conservationist and musician Paul Todd. Environmentalists are reeling from the Bush administration's rollbacks of many of Clinton's laws and policies affecting water quality, mining, endangered salmon and national forests. Jim Trees plans to replace a 140-year-old diversion dam in a Zion National Park wilderness study area with an "environmentally friendly" weir just outside the park boundary. Critics say a massive salvage-logging operation in the wildfire-burned Sula State Forest, Mont., won't leave enough snags and downed trees for wildlife and forest rejuvenation. How green is this growth? Local critics are working to stop a much-touted "model" development planned for the Ahmanson Ranch on the edge of Southern California's Santa Monica Mountains. What's wrong with 'sustainable' forestry?